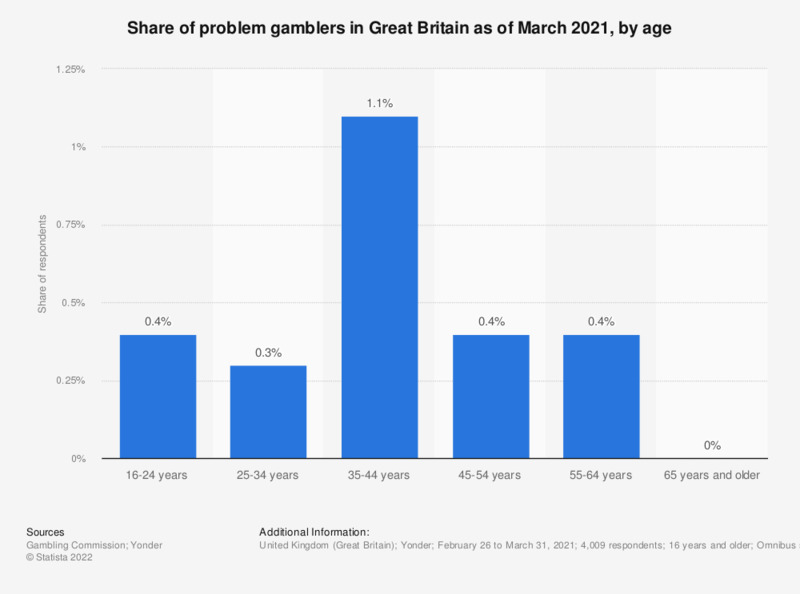 This survey shows a distribution of problem gamblers in the United Kingdom (UK) from 2016 to 2018, by age. In 2018, it was found that 1 percent of 16 to 24 year olds were problem gamblers, whereas 1.4 percent of 25 to 34 year olds were. **In March 2016 the sample was broadened to include participants aged 16+ . Additional survey information: "Problem gambling status has been defined using the short-form Problem Gambling Severity Index (PGSI)1 (Volberg, 2012), which was developed from the full 9-item PGSI. This instrument is formed of three questions, which are scored on a 4-point scale from never to almost always, asked to all participants who have gambled at least once in the last 12 months. Responses are scored from 0 - 3 resulting in a total possible score of 9. Respondents are then categorised by their total score, as follows: 0 Non-problem gambler; 1 Low-risk gambler; 2-3 Moderate risk gambler; 4+ Problem gambler."